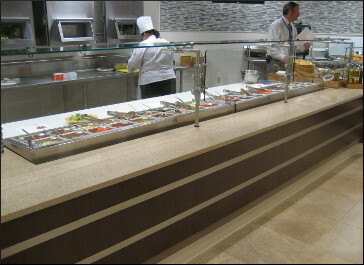 Opened in February 2013, the new kitchen and servery supports patients, visitors, and employees campus wide. PFDI developed and designed the new servery on the 2nd floor, the main/patient feeding kitchen, warewashing, patient meal assembly, and offices on the 3rd floor. PFDI's state of the art design includes: a 2-level conveyor system for transporting soiled trays from the servery to warewashing on the 3rd floor; pumping stations at deep fryers that transport waste oil to a storatge tank at the dock; and a waste pulping system used in conjunction with dehydrators that greatly reduces solid waste and can provide an end product that can be used as a soil ammenity.